Sebastien Ogier and Julien Ingrassia climbed to the top podium spot for the third time this season and the 43rd time in a career. 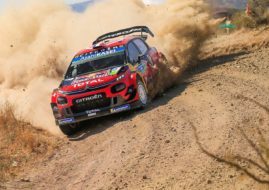 The French pair in the #1 M-Sport Ford Fiesta WRC dominantly won the Tour de Corse, the fourth round of the 2018 World Rally Championship. 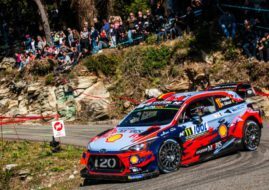 Ott Tanak/Martin Jarveoja (Toyota Yaris WRC) and Thierry Neuville/Nicolas Gilsoul (Hyundai i20 Coupe WRC) completed the podium at Corsica after three-day battle over twelve special stages, in total length of 333 kilometers. Ogier was in the lead from the first to last special stage, controlling his lead after he demolished rivals in the opening marathon 49km long stage. It seemed that only Sebastien Loeb in the #11 Citroen C3 WRC could follow Ogier, being 9.7 seconds slower while all the others were far behind. But, Loeb went off on the next stage. He stuck in the ditch and was forced to retired for that day. He restarted on Saturday but time-penalty put him out of contention for the victory. Ogier was the fastest on three of four Friday’s stages, building an advantage of 33 seconds ahead of Thierry Neuville. 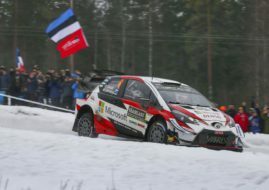 During the second day, Neuville was fighting for P2 against Kris Meeke and Ott Tanak but the fastest man on the field was Esapekka Lappi, who won two stages. Loeb proved that he is fast by winning three stages. The fight for podium places escalated on the last Saturday’s stage. Some misunderstanding with his co-driver cost Kris Meeke a lot. He went off on Stage 10 while Tanak managed to overtook Neuville, ending Saturday’s leg with 44.5 sec gap behind Ogier. On Sunday, there were no changes in the Top 3. Esapekka Lappi dropped from P4 to P7 after stopping for tire change in the penultimate stage. Lappi was fastest in the Power Stage, earning five additional points and progressing to P6 at the end of the rally. Dani Sordo (Hyundai) finished fourth, ahead of Elfyn Evans (Ford Fiesta). Evans spent a weekend with 2003 WRC champion Phil Mills as his navigator, who replaced injured Dan Barritt. Andreas Mikkelsen (Hyundai), Jan Kopecky (Škoda Fabia R5), Kris Meeke (Citroen) and Yoann Bonato (Citroen C3 R5) completed the top 10. Kopecky is the winner in WRC2 classification. It’s his second WRC2 win this season after he triumphed at Rallye Monte-Carlo.